^ "Australian-charts.com – Idina Menzel – Let It Go". ARIA Top 50 Singles. ^ "Austriancharts.at – Idina Menzel – Let It Go" (in German). Ö3 Austria Top 40. ^ "Ultratop.be – Idina Menzel – Let It Go" (in Dutch). Ultratip. ^ "Idina Menzel Chart History (Canadian Hot 100)". Billboard. 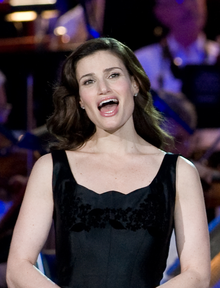 ^ "Danishcharts.com – Idina Menzel – Let It Go". Tracklisten. ^ "Chart Track: Week 10, 2014". Irish Singles Chart. ^ "Idina Menzel Chart History (Japan Hot 100)". Billboard. ^ "Dutchcharts.nl – Idina Menzel – Let It Go" (in Dutch). Single Top 100. ^ "Charts.org.nz – Idina Menzel – Let It Go". Top 40 Singles. ^ "Official Scottish Singles Sales Chart Top 100". Scottish Singles Top 40. ^ "Swedishcharts.com – Idina Menzel – Let It Go". Singles Top 100. ^ "Idina Menzel Chart History (Hot 100)". Billboard. ^ "Idina Menzel Chart History (Adult Contemporary)". Billboard. ^ "Idina Menzel Chart History (Adult Pop Songs)". Billboard. ^ "Australian-charts.com – Demi Lovato – Let It Go". ARIA Top 50 Singles. ^ "Austriancharts.at – Demi Lovato – Let It Go" (in German). Ö3 Austria Top 40. ^ "Ultratop.be – Demi Lovato – Let It Go" (in Dutch). Ultratop 50. ^ "Ultratop.be – Demi Lovato – Let It Go" (in French). Ultratip. ^ "Demi Lovato Chart History (Canadian Hot 100)". Billboard. ^ "Lescharts.com – Demi Lovato – Let It Go" (in French). Les classement single. ^ "Musicline.de – Demi Lovato Single-Chartverfolgung" (in German). Media Control Charts. PhonoNet GmbH. ^ "Demi Lovato Chart History (Japan Hot 100)". Billboard. ^ "Dutchcharts.nl – Demi Lovato – Let It Go" (in Dutch). Single Top 100. ^ "Swisscharts.com – Demi Lovato – Let It Go". Swiss Singles Chart. ^ "Demi Lovato Chart History (Hot 100)". Billboard. ^ “Frozen's "Let It Go" in 25 Languages (Official)”. Trendolizer. http://www.trendolizer.com/2014/01/frozens-let-it-go-in-25-languages-official.html 2014年2月21日閲覧. "Disney released the song "Let It Go" from the movie "Frozen" in 25 languages including Portuguese sung by Ana Margarida Encarnação." ^ “(VIDEO) A song for the Oscar and the Serbian” (Serbian). Pravda. (2014年1月24日). http://www.pravda.rs/2014/01/24/video-pesma-za-oskara-i-na-srpskom/ 2014年2月21日閲覧. "Among the selected version [for the official multi-language clip] the Serbian version of "Let It Go", performed by actress Jelena Gavrilovic in the role of Elsa." ^ Ý Ly (2013年11月24日). “Dương Hoàng Yến khoe giọng trong 'Frozen' bản lồng tiếng Việt” (Vietnamese). VnExpress iOne. http://ione.vnexpress.net/tin-tuc/showbiz/cine-tv/duong-hoang-yen-khoe-giong-trong-frozen-ban-long-tieng-viet-2914503.html 2014年2月17日閲覧. "Cô thể hiện ca khúc chủ đề Let It Go của bộ phim. (She performed the film's theme song, "Let It Go")"